12 April 2019 – Manila, Philippines: The largest global sports media property in Asian history, ONE Championship™ (ONE), once again ignited the Mall of Asia Arena in Manila for another evening of world-class martial arts action. ONE: ROOTS OF HONOR highlighted the biggest and brightest stars of ONE Championship who came out to showcase their incredible skills. 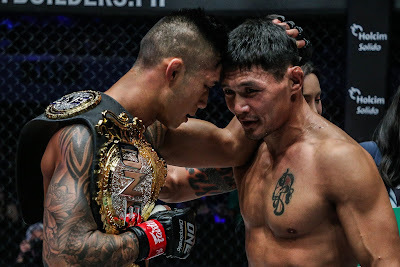 In the main event, reigning ONE Featherweight World Champion Martin Nguyen retained his title with a scintillating knockout of Narantungalag Jadambaa. In the co-main event, Joshua “The Passion” Pacio avenged a prior loss to Yosuke Saruta to be crowned 2-time ONE Strawweight World Champion. In the main event of ONE: ROOTS OF HONOR, Martin “The Situ-Asian” Nguyen of Vietnam and Australia continued his reign over the featherweight division with a spectacular knockout victory over former World Champion Narantungalag Jadambaa of Mongolia to retain the ONE Featherweight World Title. Nguyen and Jadambaa exchanged thunderous strikes in the opening round, both looking to end the night early. In the second round, Nguyen punished Jadambaa with powerful kicks to the leg before unleashing a perfectly-placed flying knee to take the Mongolian star out and remain the featherweight division’s king. In the co-main event, Joshua “The Passion” Pacio of the Philippines reclaimed the ONE Strawweight World Championship in highlight-reel fashion after knocking out Japan’s Yosuke “The Ninja” Saruta in their highly-anticipated World Title rematch. Pacio survived some early trouble courtesy of a first-round knockdown from Saruta and began getting more comfortable with his strikes as the bout wore on. In the fourth round, Pacio caught Saruta with a well-timed high kick that instantly knocked Saruta out. Japan’s Tatsumitsu “The Sweeper” Wada booked his ticket to the ONE Flyweight World Grand Prix Semi-final round after defeating Cuban Greco-Roman Wrestling World Champion Gustavo “El Gladiador” Balart via unanimous decision. The former DEEP Flyweight World Champion Wada utilized his height and reach advantage to outstrike Balart and keep the relentless Cuban grappler at bay. After three rounds of action, Wada earned the victory and the right to face Demetrious “Mighty Mouse” Johnson in the next round of the flyweight tournament. Brazilian Jiu-Jitsu World Champion Leandro “Brodinho” Issa showcased his elite grappling skills with a first-round submission win over China’s Fu Chang Xin. Issa brought the action to the ground early and wasted no time in imposing his will on the mat, working his way into an armbar with relative ease. Issa then transitioned into a triangle choke before locking in another deep armbar to force the tap from Fu in the opening round. Romanian kickboxer Andrei “Mister KO” Stoica prevailed over Morocco’s Ibrahim “Mr. Cool” El Bouniin an action-packed ONE Super Series kickboxing bout. The two world-class light-heavyweight strikers figured in an intense back-and-forth bout as they stood toe-to-toe and went strike-for-strike until the final bell. After three rounds of action, it was Stoica who was declared the winner. Unbeaten American James Nakashima picked up a massive win after an apparent knee injury rendered former World Title contender Luis “Sapo” Santos of Brazil unable to continue in the second round of their welterweight contest. Santos found success in the early moments of the bout, using his elite-level Muay Thai striking to punish Nakashima in the stand up. In the second round however, Nakashima countered a kick with a takedown and landed awkwardly on Santos’ left leg, ultimately leading to the stoppage. Filipino featherweight contender Edward “The Ferocious” Kelly weathered a storm of submission attempts from South Korean grappler Sung Jong Lee to score a second-round TKO win in front of his hometown crowd. Kelly fought off a wave of kneebar and heel hook attempts from Lee, who was in constant pursuit of grappling exchanges. Kelly turned the tables in the second round however, as he fended off yet another submission attempt and pounded Lee out with piston-like punches for the stoppage win. Brazilian kickboxing World Champion Anderson “Braddock” Silva announced his arrival to the global stage of ONE Championship, knocking out Australia’s Andre “The Giant” Meunier in the first round of their ONE Super Series kickboxing bout. The hard-hitting heavyweights wasted no time in providing fireworks as they traded massive combinations right off the bat. Midway through the opening round, Silva connected on a counter-right hook that knocked Meunier out cold instantly. “Pretty Boy” Kwon Won Il of South Korea bounced back in a big way after making quick work of Filipino veteran Eric “The Natural” Kelly with a flash knockout in the first round. Kwon landed a well-placed right straight that rocked and dropped Kelly. The Korean prospect finished things off with some ground-and-pound for the stoppage win in just 19 seconds. Thai legend Saemapetch Fairtex was once again victorious on the ONE Super Series stage, as he outstruck Serbian-American Ognjen Topic en route to a hard-earned a majority decision win. Saemapetch was aggressive from the opening bell, overwhelming Topic with a seemingly unending barrage of strikes. Topic rallied late in the final round, but it proved to be too late, as Saemapetch walked away with the judges’ decision. China’s “The Stalker” Xie Bin scored another impressive win after submitting Afghanistan’s Ahmad Qais Jasoor in the second round. It was a competitive opening round between the two bantamweight contenders, as they displayed their grappling skills by trading submission attempts. In the second round, Xie wasted little time in getting the action to the ground and worked his way into a deep D’Arce choke that left Jasoor with no other option but to tap out. Singaporean flyweight Niko Soe was triumphant in his return to the ONE Championship Circle, defeating Indonesian wrestling champion Eko Roni Saputra via doctor stoppage due to injury. Soe connected on a glancing elbow midway through the first round that opened up a cut on Saputra’s head, prompting an official halt to the action. After getting inspected by the cageside physician, it was ruled that Saputra would be unable to continue and Soe was awarded the TKO victory. Lerdsila Phuket Top Team of Thailand put on a striking clinic as he defeated Japan’s Momotaro via unanimous decision in their ONE Super Series Flyweight Muay Thai bout. The multiple-time Muay Thai World Champion utilized a masterful mix of thunderous kicks and well-timed throws to outclass the Japanese striker on all fronts. After three rounds of action, Lerdsila earned the nod from all three judges. Vietnamese-American women’s atomweight and ONE Championship newcomer Bi “Killer Bee” Nguyenwas impressive in her promotional debut, dominating Indonesia’s Dwi Ani Retno Wulan en route to a first-round TKO win. Nguyen was relentless as she took Wulan down to the mat early in the opening round. From there, Nguyen seamlessly transitioned into full mount and punished her opponent with strikes from the top to pick up the stoppage victory. Kicking off the action at ONE: ROOTS OF HONOR, Filipino flyweight Ramon “The Bicolano” Gonzalescontinued his impressive run in ONE Championship by making quick work of Japan’s Akihiro Fujisawawith a submission win in the first round. Fujisawa attempted a takedown early in the first round but found himself getting caught in a deep guillotine choke. Gonzales postured up and tightened the choke, forcing Fujisawa to tap out abruptly. ONE Championship (ONE) is the largest global sports media property in Asian history, and the largest producer of millennial live sports content in Asia. Headquartered in Singapore, ONE is the Home of Martial Arts, and is the world's largest martial arts organization, hosting bouts across all styles of martial arts such as Muay Thai, Kickboxing, Karate, Kung Fu, Silat, Sanda, Lethwei, Mixed Martial Arts, Tae Kwon Do, Submission Grappling, and more. ONE hosts the biggest sports entertainment events across Asia, featuring some of the world's best martial artists and world champions on the largest global media broadcast in Asia. ONE eSports, a subsidiary of ONE Championship, runs Asia's largest global eSports Championship Series with some of the biggest blockbuster game titles in the world. In addition to its digital platforms, ONE Championship broadcasts to over 2.6 billion potential viewers across 140+ countries with some of the largest global broadcasters, including Fox Sports, ABS-CBN, Astro, ClaroSports, Startimes, Thairath TV, Skynet, Mediacorp, Great Sports, Tencent, Star TV, Mediaset Italia, ProSiebenSat.1, Dubai Sports, Turner Sports, and more. New Zealand Barley Grass: What Makes it So Good?